Emma and her friends have found a safe shelter at last! Having followed the directions of the mysterious Minerva away from Grace Field House, Emma's family have been led to a bunker stocked with food, clothes, and even a working piano. But one person in particular isn't thrilled by this turn of events - the bunker's existing occupant, a callous former escapee who claims to have lived here for thirteen years. This new adversary wants nothing to do with Emma and her siblings, but his knowledge may be the only thing that can save them from the world outside. Can Emma convince this man to risk his life for fifteen orphans? For the first six volumes of The Promised Neverland , the immediate threat of discovery and death hung over our leads every step of the way. All of their actions at Grace Field House were monitored, and all of their choices were made with the clear knowledge that if they didn't act now, they'd be lost forever. Having broken the bars of their prison and crept across a forbidding wilderness, volume seven sees our heroes at last finding a moment to rest, as they settle into the B06-32 bunker. And yet, in spite of the guillotine drawing a bit further back from their necks, this volume feels just as urgent as ever, and cleverly reminiscent of the manga's earliest material. The Promised Neverland was initially founded on a cat-and-mouse game being played between Isabella and her charges, with Emma and her friends having to work hard to overcome Isabella's profound advantages in terms of strength and knowledge. When Grace Field House burned down, so too did that paradigm, leaving the story as a more straightforward chase/adventure narrative. Here in volume seven, we at last see a return to that initial paradigm, as Emma and her companions work to outmaneuver and outwit a new adult - a former farm child and thirteen-year resident of the bunker, and Emma's newest reluctant teacher. The majority of this volume takes place in the bunker itself, as Emma and Ray survey their new surroundings, search for clues, and attempt to draw information from the bunker's occupant. As with the sixth volume's cave setting, this choice unfortunately doesn't leave much room for Posuka Demizu 's art to shine, but there are still plenty of the visual flourishes that gave Grace Field House such a clear identity. Additionally, the styles of “shots” used for Demizu's paneling seem to be diversifying all the time, as her originally illustration-focused talents embrace the angles and visual gimmicks afforded by sequential art . The drama that unfolds in these claustrophobic chapters felt satisfyingly reminiscent of Neverland's early days, with the bunker's long-term occupant serving as a natural replacement for Isabella. As in those early games, this man is clearly an adversary of the children, but the complex and interwoven nature of each of their needs gives Emma and Ray just enough space to negotiate for their own lives. While watching these two put their wits to work mastering the great outdoors has been fun, volume seven demonstrates that Neverland is at its best when they have an actual opponent to face. The prominence of this new quasi-antagonist simultaneously acts as a powerful illustration of one of Neverland's core themes - how systems of oppression end up enlisting members of that oppressed class to perpetuate themselves, creating a tragic chain of violence. For Isabella and Krone, the answer to facing an impossibly horrible future was to submit to that future, and become agents of the demons themselves. For this man, though he still considers himself an enemy of the demons, the horror of losing his own family has hardened his heart, and left him unable to believe escape is even possible. I appreciate Neverland's consistent emphasis on the true cruelty of these systems, and am eager to see if this man will be the first to overcome his trauma and actually help break the cycle. All in all, The Promised Neverland 's seventh volume feels like both a return to form and a bold step forward, setting the story's ambitions towards a new horizon while reintroducing some of the initial concepts that made this manga so thrilling. 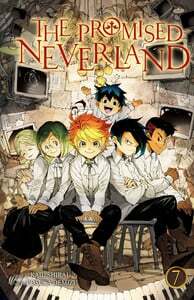 The Promised Neverland continues to stride forward with tremendous confidence.